GrassrootsHealth did an analysis of type 2 diabetes, comparing GrassrootsHealth D*action participants with the National Health and Nutrition Examination Survey cohort (NHANES). GrassrootsHealth participants ≥ 20 years of age (N=4933) had a median serum level of 41 ng/ml and a type 2 diabetes incidence rate of 3.7 per 1000 population. In contrast, the NHANES cohort from 2005-6 (N=4078) had a median serum level of 22 ng/ml and a type 2 diabetes incidence rate of 9.3 per 1000 population. 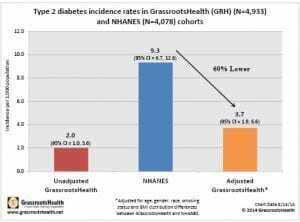 Participants in the GrassrootsHealth cohort had a 60% lower risk of type 2 diabetes compared to participants in the NHANES cohort after adjusting for age, gender, race, BMI and smoking status. 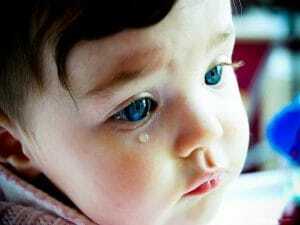 Children and Type 1 Diabetes – What Happens 30 Years Later? A birth cohort study was done in Finland, enrolling women who gave birth in 1966 and following their children to 1997. 12,055 women were enrolled and 10,366 children were included in the analysis. Data was taken during the infants’ first year of life about frequency of vitamin D supplementation and whether it was at, above or below the recommended dose of 2000 IU/day. Children with regular supplementation, regardless of dose, had a lower rate of type 1 diabetes than those who did not. Among those who received regular vitamin D supplementation, those receiving at least 2000 IU/day had an 80% reduced risk of type 1 diabetes compared to those who received smaller doses. It might be time to join D*action and test your vitamin D level from the comfort of your home. 48 scientists agree that 40-60 ng/ml (100-150 nmol/L) is the recommended amount of vitamin D in your blood to prevent disease. 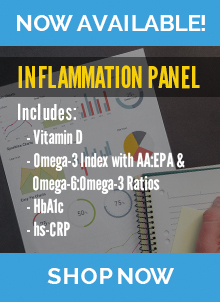 In this video, Dr. Edward Gorham correlates diabetes incidence with vitamin D blood levels using data from NHANES and the US Department of Defense (DoD). He also presents the Finish study presented above, if you would like more details. Listen to this talk to find out more about how vitamin D affects the incidence of diabetes and if vitamin D can help after a diabetes diagnosis.